Anyhoo a while ago I worked on this tower defence game that combined painted bgs with pixel art characters and 3d vehicles. Oh and photo-sourced user interface. Sounds terrible but in fact it turned out pretty decent, imo. 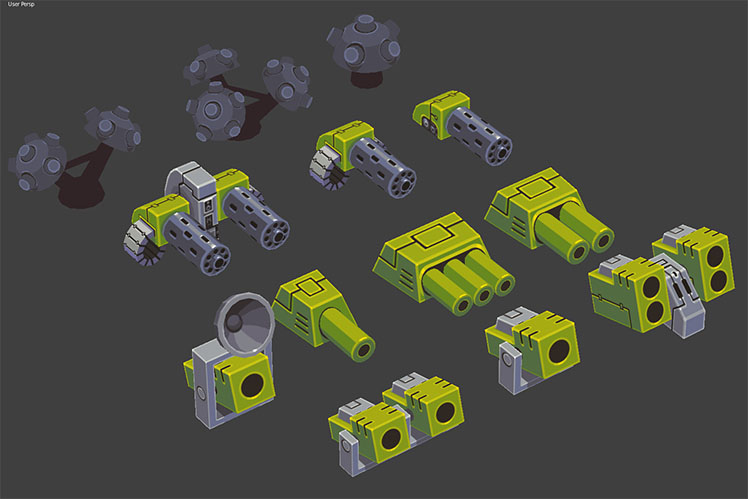 Worth noting is the texture style we used to get the renders to match the pixel art look. Quite simple stuff, no shading (all shading drawn in textures) and some sharpening and an outline added in post-proc. The textures are not pixel art at all but rather pixel-art informed freehand photoshopping. Time was super-scarce so everything had to be done very quickly. For example, all the sprites have 4-frame running cycles. Hit me up if you have any questions, I'd be glad to share. So, it's a tower defense game, eh? Looks more like an explorable open world. That's not a bad thing. Here's decent vid I found. Do you prefer GRAFX2 over ProMotion? Thanks! It's a TD but with more micromanagement elements, like a light-RTS thrown on top. I do prefer GraFX2 to ProMotion, yes. PM has some more advanced features but is missing some other ones. GraFX2 is also free and extendable with used scripts. Overall I find GraFX2 more immediate, possibly influenced by my history of using DPaint3 and Brilliance2 on Amiga for years.